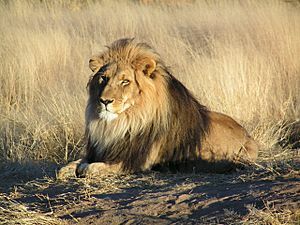 The lion is Africa's apex land predator. Apex predators are predators with no natural predators of their own. They are at the top of their food chain. Apex predators have big effects on the animals and plants lower down the food chain. If they become extinct in an area, many changes happen. In recent times, it is often humans who have removed top predators. An example of apex predators affecting an ecosystem is in Yellowstone National Park. After the gray wolf was reintroduced, in 1995, researchers noticed big changes occurring in the Greater Yellowstone Ecosystem. Elk, the primary prey of the gray wolf, became less abundant and changed their behavior. This freed the riparian (river) zones from constant grazing. This allowed willows, aspens, and cottonwoods to grow, so creating a habitat for beaver, moose, and scores of other species. In addition to the effects on prey species, the gray wolf's presence also affected the park's grizzly bear, a vulnerable species. The bears, emerging from hibernation, chose to scavenge off wolf kills after fasting for months. They can also eat wolf kills in autumn to prepare for hibernation. As grizzly bears give birth during hibernation, a greater food supply may improve the mother’s nutrition and increase the number of cubs. Dozens of other species, including eagles, ravens, magpies, coyotes, and black bears, have been seen scavenging from wolf kills. Human hunters, if they so choose, are the most capable predators. They are often able to catch or kill any animal due to tool use (including firearms and fishing gear), intelligence, and training of dogs. Dogs themselves have the power, strength, speed, agility, voracity, and cunning that make other large carnivores lethal. The saltwater crocodile is the largest living reptile and is the dominant predator throughout its range. The related Nile crocodile, which even preys upon great apes (humans and chimpanzees), is at the top of the food chain in African waters. Wolves operate in packs in which each wolf has a specialized role in hunts that would otherwise fail, often against prey much larger than the individual wolves. All wolf subspecies, including dogs and dingos, and the closely related coyote, are successful predators and may sometimes prey on livestock and vermin—and are competent defenders. The tiger is one of the largest non-aquatic mammalian predators in the world. Pictured is the Bengal tiger, the subspecies of tiger most infamous for man-eating. All members of the cat family, including even the domestic cat with obvious similarities of build and behavior to tigers and leopards, are consummate predators irrespective of size. Electric eels have a defense that no non-human predator can circumvent. Caimans, jaguars, giant otters, piranhas, and humans usually avoid them lest they get a defensive electrical shock, the same sort of electrical shock that it uses for subduing prey. The whale shark, the world's largest shark and fish, has a reputation as a "gentle giant" as a filter feeder. Despite having no prey larger than small fish, it has no natural predators and is an apex predator. Many birds of prey (like this bald eagle) occupy the top of their food chains and are apex predators. Most of them are, however, subject to intraguild predation. With this lethal mouth and a powerful swing of its tail, the American alligator has only armed humans and larger alligators to fear in the swamps of subtropical North America in which this predator lives. Convergent evolution has given the Tasmanian devil a superficial similarity to such small, formidable apex predators among the Carnivora as badgers and terrier dogs—but they are very different mammals of the marsupial order. They are similarly deadly to small animals as true Carnivorans of like size. The honey badger is a fierce predator capable of holding its own against such predators as snakes, big cats, bears, hyenas, dogs, and humans. It gets its name from its ability to take honey and the bees that defend it. Its prey also includes cobras. In this diorama, the giant squid loses to a far larger and more powerful predator, the sperm whale. Sperm whales often bear scars from encounters with giant squid that ended with the squid being eaten. The Eurasian brown bear, whose range paradoxically extends into North America where it may be known as a grizzly bear or a Kodiak bear is a versatile, adaptable omnivore. The polar bear is the largest living species of bear. The aforementioned Kodiak bear is the only species to rival it in that regard. The largest polar bear on record, reportedly weighing 1,002 kg (2,209 lb), was a male shot at Kotzebue Sound in northwestern Alaska in 1960. Tyrannosaurus rex was one of the largest carnivorous dinosaurs, possibly growing to lengths of over 12.8 meters (42 feet) and weighing 6 to 10 tons, it was one of the most supreme predators of its time. It is estimated to have been capable of exerting the largest bite force among all terrestrial animals. Giant otters are known to have piranhas and even caimans as prey. Apex predator Facts for Kids. Kiddle Encyclopedia.